Let's continue our coverage with a preview of Group C.
Korea grabbed the final podium spot two years ago with a convincing win over Lebanon in the battle for third place, but they know that if they will return to the top three, they'll need to put forth more effort here in Nonthaburi. With the entry of Australia and New Zealand and the improvement by teams like the Philippines and China, the Koreans should be aware that the top will be crowded with teams who are either bigger or deeper. Still, that doesn't mean that the second winningest country in U18 Asia history have nothing up their sleeves. 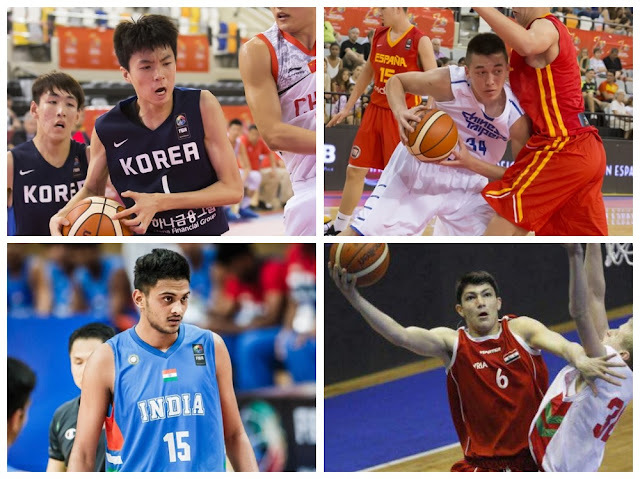 National youth team veterans Sechan SeoMoon and Lee HyunJung along with fellow NBA Global Camp invitee Yeo JunSeok should make Korea a force to reckon with, while former U16 standouts Cha MinSeok and Moon JeongHyeon should add even more firepower to the East Asian squad. They should have little trouble topping their group, but a likely meeting in the Quarter-Finals either the Philippines or Lebanon against could make or break their campaign. Chinese Taipei will be giving up a ton of size in this competition against most opponents here in their group, but that doesn't necessarily mean they will be short on talent. The inside pairing of Jonah Morrison and Chen Fan Po-Yen will be spearheading their efforts on both ends of the floor, while U16 veterans Ma Chien-Hao and Lin Lin should be among their top weapons on the perimeter. By all intents and purposes, the Taipei quintet will sail through rough seas here in Nonthaburi as they will be hard-pressed to beat Korea in group play, and winning against India isn't a guarantee given the Indians' towering frontcourt and their underrated but very skilled guards. The Taiwanese would do well to finish 2nd place in this group lest they face the prospect of having to beat New Zealand in the Qualification to the Quarter-Finals, which is a mountain that may be too tall for them to climb. India have never finished on the podium here at the U18 Asia level, and though that will likely not change this year, they do have maybe their best chance of qualifying to the U19 World Cup. The only time they finished among the top four teams was more than four decades ago in 1972, but with the promising trio of Princepal Singh, Harsh Tomar, and Sejin Mathew, the U18 Young Cagers are poised to make a lot of noise here in Nonthaburi. Singh, in particular, is one to watch. The 6'10 double-double machine is the only Asian player to have been invited to the 2018 NBA Global Camp, the Basketball Without Borders (BWB) event during the 2018 NBA All-Star Game, and the 2018 BWB Asia Camp in India. No doubt he will be this team's main man. Tomar and fellow frontliner Pratyanshu Tomar will provide support up front, while Mathew, BWB Asia participant Prashant Tomar, and U18 SABA Qualifiers leading scorer Rajeev Kumar are expected to carry the scoring load in the backcourt. The key game for India will be the one against Chinese Taipei. If they win that, they will likely play Thailand or Bahrain in the Qualification to the Quarter-Finals, which means a relatively easy path to the Quarter-Finals, where they will meet either China or the Philippines. Experience: No players with prior experience in any continental level tournament. Syria snuck into the U18 Asia tournament with a close win over Jordan in the U18 WABA Qualifiers, but coach Mohammad Haytham Jamil's crew is determined to make a splash here in Nonthaburi. Much will depend on the production of 6'8 center Mhd Ammar Al Ghamian, who was their most efficient player in the U18 WABA Qualifiers with 15.0 points and 13.5 rebounds per game. He should be backstopped by the wing duo of Elias Azrie and Ahmad Habash, who averaged 9.5 and 9.0 points respectively in the same competition. Syria is entering the U18 Asia Championship with tempered expectations, though, so just being able to be competitive should already be cause for celebration for them. Still, even the likes of Chinese Taipei and India would do well to take this squad seriously lest the Syrians pull the rug from under the Taiwanese's and Indians' legs.